Last February I was sitting in a hot car in the parking lot of Fry's, waiting. 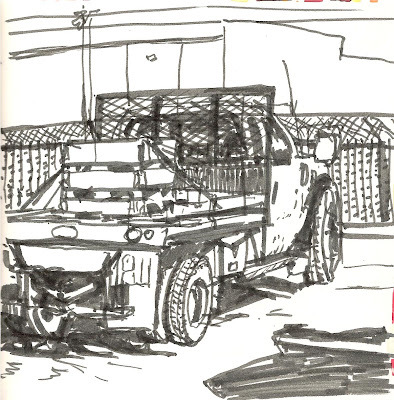 While I waited I sketched the closest contractor's truck. Funny how satisfying these little sketches can be when there is no pressure to make them, just passing the time! 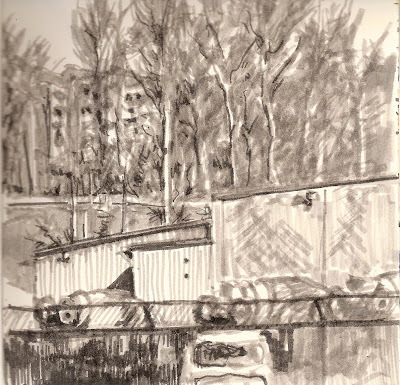 The truck finally rolled away so I started in on the concrete trucks across the fence. This was with value pens. Only got partway into the second value before my pal returned and we left. Have to say, I love Tony's sketch of the giant typewriter eraser sculpture on the logo. Perfect for this blog!! That is a very, very cool effect Beth. Love the drawings Beth! Looks like our love of the Fisherman's Terminal is becoming a "trend."